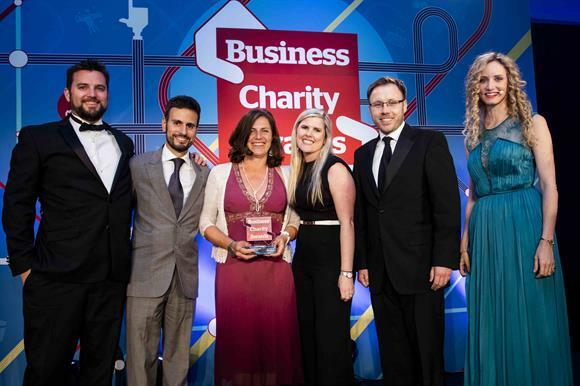 The pharmaceutical company GSK has been crowned Business of the Year at Third Sector’s Business Charity Awards, which recognise the outstanding contribution that UK companies make to good causes. The winners of the awards were announced last night at a black-tie dinner at the Marriott Grosvenor Square in London, hosted by the TV historian Suzannah Lipscomb. GSK’s long-standing partnership with Save the Children has harnessed expertise from both organisations to reach more than 2.6 million children in 41 countries, including treating more than 187,000 children for malaria, pneumonia or diarrhoea. The collaboration had earlier won the Charity Partnership, Health, Beauty & Pharmaceuticals award. Save the Children’s partnership with Entertainment One, owners of the Peppa Pig cartoon character, won the Charity Partnership, Media & Entertainment award. Whizz-Kidz, which provides equipment to disabled children and young people, was also named in two winning partnerships. Its collaboration with Jardine Motors Group won the Automotive & Transport category while its link-up with Simply Business was named the winner in the Financial Services bracket. Other winners on the night included Yorkshire Building Society, which was crowned CSR Team of the Year, while the Axis Foundation, the charitable arm of the contractor Axis, was named Foundation of the Year. Susan Barrowman, charity manager at the retailer Harrods, was named Outstanding Employee for her exceptional commitment to raising funds for the NSPCC.